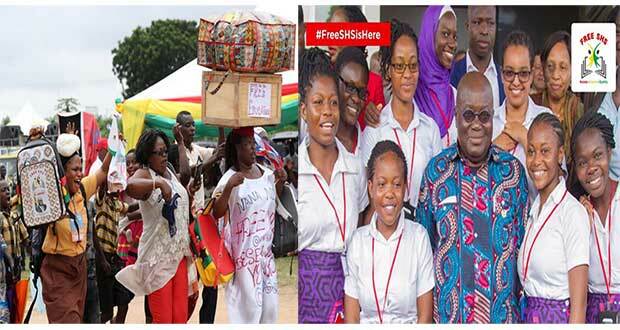 President Nana Addo Dankwa Akufo-Addo has announced that the restoration of teacher trainee allowances has taken effect from Tuesday September 12 alongside the official launch of the free senior high school (SHS) programme. The President said this at the launch of the Free SHS programme at the on Tuesday. “Central to the prospects of this policy is the teacher. A well trained, confident and content teacher is essential in the delivery of quality education. If we are to succeed as a nation and if we accept that education is central to national development, then it is clear that quality teacher training is vital to our nation’s development,” he said. About 45,000 teacher trainees in 41 public colleges of education are expected to receive GH¢204 each as monthly allowance from the Students Loan Trust Fund (SLTF). Although each student is entitled to GH¢400, part of that — GH¢196 — will go directly to the colleges to pay for trainees’ utilities and feeding. The amount is, however, GH¢248 less than the GH¢452 the trainees were receiving after deductions before the allowance was scrapped in the 2013/2014 academic year by the previous government. The figure means that each trainee will receive GH¢816 directly per semester (given that a semester is four months), while the government will spend GH¢144 million per academic year. In total, the government is expected to spend at least GH¢18 million monthly on the projected number of students, with GH¢9.18 million of the amount going to the trainees in monthly allowances, while GH¢8.82 million goes to the colleges for feeding and the payment of utilities.